The next PDC contender may be your fellow countryman, teammate, or neighbor! Get Free Fan Alerts whenever your nation is ready to compete. 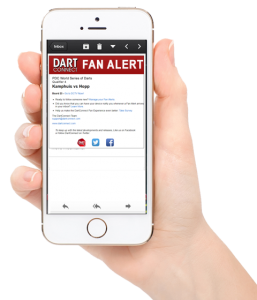 Get your FREE guest account to start receiving Fan Alerts! If you have not done so, register for your free guest account, so we know where to send your notifications! Already know a player you want to follow? Go to fan alerts and search for them. Don’t see their name? Tell them to sign up for a premium membership so everyone can follow them! Want to know who from your country are competing in a specific event? Click any link below to go directly to that event’s player list*. * Final player list subject to change up to the time of live competition. 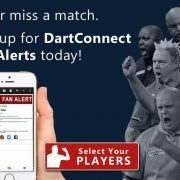 Exclusive: LIVE updates ONLY on DartConnect TV! Free – no membership required. Learn how to save DCTV to your home screen, just like apps you download from the app store. What is a PDC Tour Card? A tour card is a coveted prize that guarantees free entry into the highest paying tournaments for two full years. Q-School is packed with former tour card holders anxious to regain position, along with hungry newcomers, all vying for a chance to compete on the circuit. 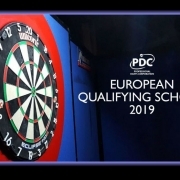 PDC Qualifying School is an annual open competition that allows ambitious players from around the world to compete for the right to play in the Players Championship Tour and European Players Tour. These two tours are regarded as the highest level of play in darts. Q-School is comprised of four one-day events in Germany and four one-day events in England. Twelve two-year tour cards will be awarded to the top performers. Additional tour cards will be awarded based on how a player’s Q-School performance affects the PDC Order of Merit, to complete the 128 player field.